It's not easy to get inside the Champlain Valley Dispensary, one of Vermont's four state-licensed medical marijuana purveyors. First, you have to find it. The location doesn't appear on Google Maps, and it's not on the CVD website. The phone number isn't listed anywhere, either. Unless someone gives it to you, you can't call for directions. If you do happen to find the small office in Burlington's waterfront Wing Building, you can't just walk in. A staffer will only unlock the door if you have an appointment — he or she can see you through a video camera and hear you via intercom. And you can only make an appointment if you're on the state's medical marijuana registry. Vermont residents who have been diagnosed with a severe or life-threatening condition, such as cancer, AIDS, wasting syndrome or multiple sclerosis, can qualify for the registry. Right now, nearly 1,800 people are on the list; I'm one of them. I was diagnosed with relapse-remitting MS in 2002, and fortunately for me, it's been slow to progress. I've been joking about getting on the medical marijuana registry since Vermont created it in 2004. I stopped laughing about it a decade later, when I started having excruciating, spastic pain at night in my right shoulder and arm. In the fall of 2014, my neurologist prescribed a muscle relaxant called baclofen. I added that to my regimen of MS-related medications, but it knocked me out and made me groggy the next day. I wanted a painkiller that worked while I was awake. A year ago, I asked my doctor to help me get medical marijuana. Smoking pot had never done much for me the few times I'd tried it in college, but I'd read that some people swear by it as a nonaddictive pain reliever. I was ready to try anything. My partner, Ann-Elise, encouraged me, but my dad was less enthusiastic. When I called him and said I was getting on the list, he said he was skeptical about the health benefits of pot. And he had a dim view of the whole system. Medical marijuana, he warned, was "a slippery slope" to legalization for recreational use. "It's too easy for people who don't really need it to get it." Au contraire, mon père. Everybody in Vermont knows somebody who knows somebody who can get weed. But jumping through the legal hoops here is much, much harder. Vermont has a reputation for having a restrictive medical marijuana law, and, in my experience, it's well deserved. My neurologist agreed to help me get on the registry in February 2015. Two weeks later, the mailman delivered the fattest envelope I've ever received. Inside were my doctor's notes attesting to my symptoms, along with forms for me to fill out. I had to give my mailing address, driver's license number, weight, height and eye color. I also had to sign a page of patient acknowledgments, which included the following: "I understand if my application is approved, marijuana may only be used for symptom relief" and "I understand that if my application is approved, marijuana may not be transported in public unless secured in a locked container." To be approved, I'd have to complete the application, get it notarized, and send it to the Department of Public Safety with a $50 check and a photo for my ID card. It took me a couple of weeks, but I finally got it all together and sent it in. Then I looked for a locked container in which to transport my stash. I found a perfect one — a tan metal box that Ann-Elise had inherited from her grandfather, its tiny key dangling from a gold American-flag keychain. I put the box in my car so I'd be ready to dash to the dispensary. Then I waited — and waited — for my card to come in the mail. I got it in early April. I looked through the forms for a phone number for CVD, but all I could find was the URL and an email address. As a new client, I had to sign up for a half-hour initial consultation. But when I went to the website and checked the online appointment scheduler, I found none available — for months. I sent CVD a message through an online form. Then things got busy at work, and I forgot about it. A few weeks later, I sent another message and got a call back. But by then my nightly pain had subsided; I didn't follow up until it intensified again in the fall. When I talked with CVD founder Shayne Lynn for this story, he confirmed that it's tough to get on the registry. "You have to be very engaged in getting your card," he said. "It does take a lot of follow-through." CVD's low profile is intentional. If he publicized the phone number, Lynn said, "I would have had to hire a person full time to answer the phones." Medical marijuana is legal in 23 states and in the District of Columbia, and it's increasingly popular in Vermont. Despite being shrouded in secrecy, CVD is struggling to keep up with demand. When Lynn opened the dispensary in June 2013, he said, he expected to serve 85 patients a year. Just two and a half years later, CVD and its sister organization, Southern Vermont Wellness in Brattleboro, now see 1,100 clients annually. Sometimes it can take a few weeks to get an appointment. Partly that's because staffing takes time. New employees must be fingerprinted and pass a background check, which can take as long as five weeks for each. Many of Lynn's 40 staffers work behind the scenes at facilities in Milton and South Burlington, cultivating crops, manufacturing pot-related products and making edibles. Starting soon, Lynn will have employees doing home deliveries. And he plans to expand CVD's presence on the Burlington waterfront, adding a new, larger office down the hall. Medical marijuana, he told me, "is an alternative medicine that works for a lot of people. Our experience is that it's really changed a lot of people's lives." I hoped it would change mine. When I arrived at the dispensary at the end of November for my first appointment, I had my locked box, my official pot card, a secondary form of ID (my passport) and $200 in cash. The feds still classify marijuana as an illegal substance, so credit card companies won't let cardholders charge their pot purchases; dispensary clients have to pay with debit cards or cash. Health insurance won't cover it, either. Because I'd stopped at the credit union, I was running a few minutes late. I stood in front of the video camera and announced my arrival. A sign on the door reminded me not to take photos or video inside. There's no waiting room, so I sat briefly in one of two chairs in the hallway before a twentysomething guy ushered me inside and handed me a clipboard. More forms — this time covering privacy rights and the dangers of smoking. I tried to fill them out and take in the scene at the same time. Two dudes staffed the dispensary on my first visit. Inside, the one-room office feels like equal parts doctor's office, general store and the dorm room of the biggest pothead on campus. A counter divides the room into two realms — one for patients and one for staff. 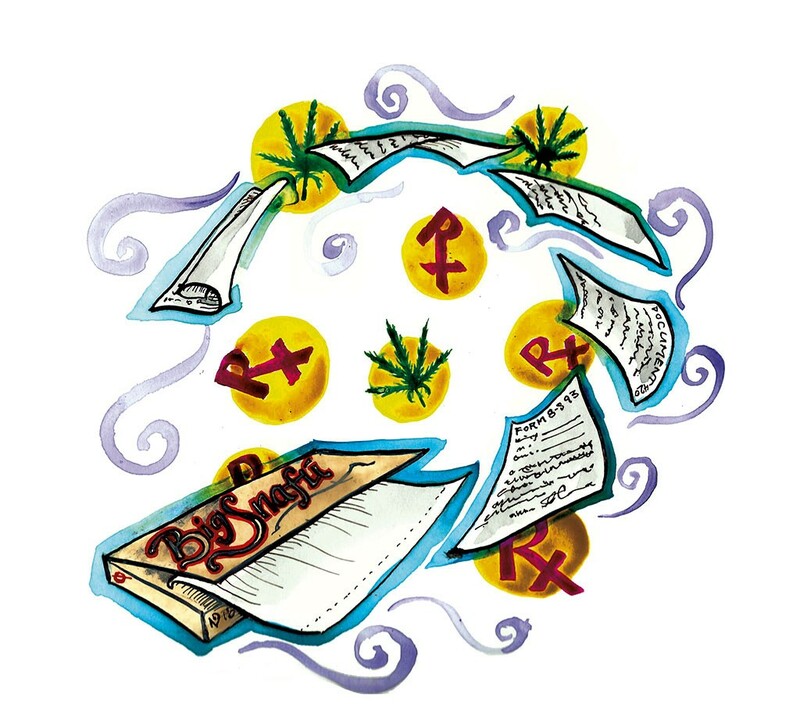 A bookcase on the patients' side displays an eclectic array of products that don't contain cannabis — CVD T-shirts, winter caps and trucker hats, along with munchies, journals and cutting boards. A massive gray safe behind the counter holds the pot. Painted on one door are marijuana leaves; on the other, a giant bud. A chalkboard menu on the wall lists items for sale: hash, kief, edibles including brownies, fire cider, caramels, cheese nibs. One end of the counter is a glass case containing pipes and other paraphernalia. The other end is an intake station, with a computer and a chair on either side. I sat down and finished my forms. A helpful, knowledgeable staffer named Zach, who declined to give his last name, guided me through the enrollment process. I told him I didn't want to smoke the pot, and I didn't want to chew it. He recommended two tinctures — Indica and Sweet 'n' Sour Widow. I paid $47.50 for two tiny brown bottles topped with medicine droppers. There were no dosing instructions on the label. Zach advised starting with three to five drops per dose. He said I could take it with maple syrup, which sounded appealing. That night, I added four drops of Indica to a spoonful of maple syrup — a spoonful of syrup helps the medicine go down! According to CVD, the tincture is "created with a blend of Indica strains specifically chosen to alleviate pain and anxiety while encouraging a restful sleep." When you smoke pot, it hits you immediately. But Zach had said it could take 20 minutes to two hours for the tinctures to take effect, so I swallowed my first dose a couple of hours before bedtime. The pain returned. I popped a pill to fall asleep. The next night I tried four drops of the Sweet 'n' Sour Widow, a cannabidiol-enriched tincture that's supposed to reduce chronic pain and inflammation. Same result. I tried five drops of each on different nights. Nothing. Then I put the pot aside for a couple weeks; we traveled to North Carolina to see my family for the holidays, and you can't legally bring marijuana across state lines. When I asked Lynn about my frustrating initial results, he sympathized. "It does take some trial and error," he conceded. Some people find that "really unnerving," but ultimately the process is about learning what works for your body. I told him I'm used to having a doctor hand me a prescription and tell me exactly how much to take and when. "This is the opposite of that," Lynn said. In January, I set up another appointment to try something smokable. I bought a packet of Northern Lights buds and a blend called Exodus Cheese. A woman named Danielle helped me pick out a $10 glass pipe and patiently showed me how to smoke it. I bought a Pac-Man lighter, too. Zach recommended I also keep trying the tincture — up to 10 drops at a time. That night, after my kids went to bed, I unlocked my box. I put a bud in my new pipe, slipped out onto the back porch, lit it and inhaled twice. I didn't feel high. But I didn't have any pain, either. For the first time in two months, I fell asleep without taking any pain meds and woke up the next morning alert and pain-free. I thought it might have been a fluke, so I tried it again the next night. This time I felt a little funny — was I high? Honestly, I couldn't tell. I did scarf down a few chocolate-peanut-butter cups. But again, no pain. And no pills. The whole time I've been trying to manage my pain, I've also been trying to determine the cause. It could be MS-related, or it could be a result of pressure on my spine or one of my nerve roots. I recently saw a physician's assistant at the University of Vermont Medical Center neurological surgery office who prescribed physical therapy, and I'm going to try that — and acupuncture. But I'm also going to keep experimenting with pot. The card needs to be renewed annually, and my renewal's due at the end of March. Better get that paperwork in the mail. The original print version of this article was headlined "My New Bud"